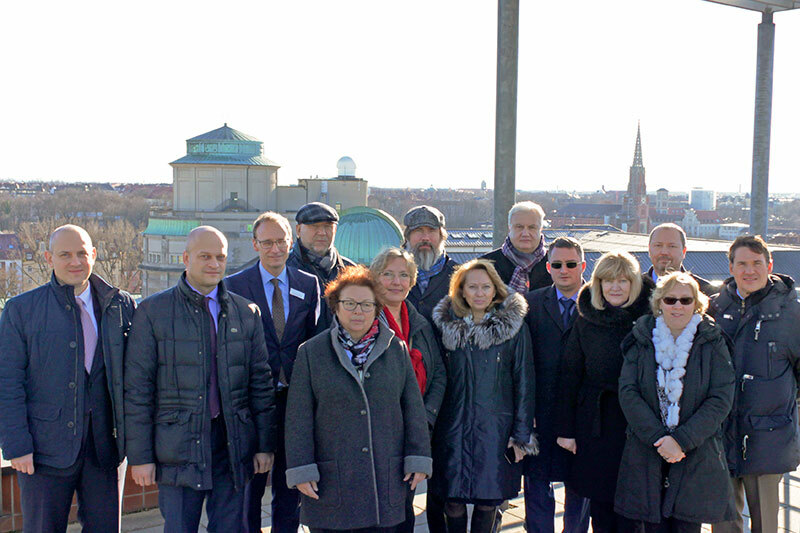 From 5 to 7 December 2018, the IRZ organised a study visit for a high-ranking delegation from the Russian Federation (RF) to Hamburg. 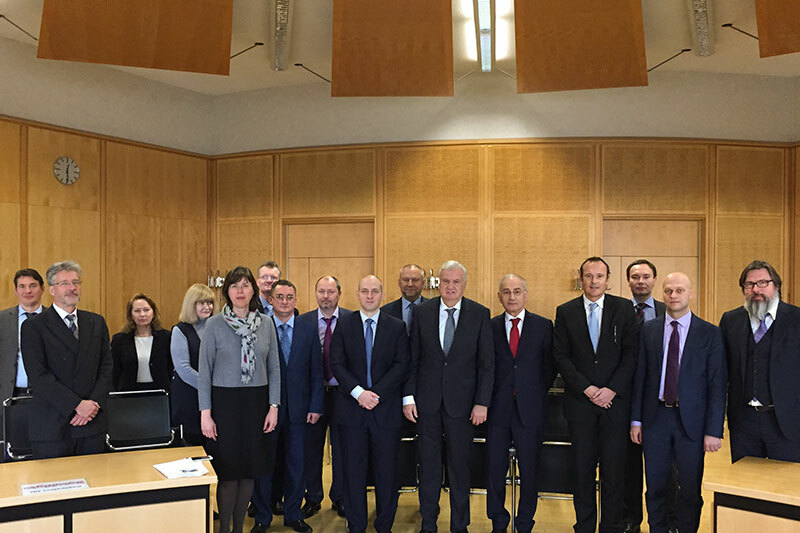 On the Russian side, the visit was organised by the RF Association of Lawyers, which invited high-ranking representatives from various organisations and authorities in the RF to discuss the subjects of the insolvency of legal entities, tax law and intellectual property with their German colleagues. The delegation was led by Sabir Kekhlerov, advisor to the Prosecutor General, former representative of the Prosecutor General for the RF and a member of the President’s Council for the Russian Federation for the codification and perfection of legislation on civil law. Hans Randl, Deputy Director, Hamburg services and organisation. Within the framework of this visit, two representatives from the Federal Tax Service for the RF took the opportunity to give presentations on dealing with tax liabilities and the latest developments in tax administration in the RF. At the Regional Court of Hamburg, the group was welcomed by its President, Dr. Marc Tully, who presented an overview of the role of the Regional Court together with Heike Hummelmeier and Malte Hansen, both Presiding Judges at the Regional Court, and then went on to explain the possibility of international commercial criminal cases being processed in English at the Regional Court of Hamburg. Dr. Holger Schatz, Head of Law Enforcement and Law, welcomed the delegation to the judicial authority in Hamburg. Afterwards, Regional Court Judge Dr. Axel Herchen, Head of the Insolvency Court in Hamburg, and Dieter Gerichhausen, Judicial Officer and Head of Department at the Insolvency Court, led expert discussions on selected issues of insolvency law with the delegation members. At the meeting at the Hanseatic Bar Association, the participants were welcomed by its President Dr. Christian Lemke. Following an overview of the role of the Bar Association, the delegation members were able to discuss legal training in Germany and intellectual property with the attending speakers, lawyers Tatjana Baki, Dr. Rolf-Eckart Schultz-Süchting and Dr. Thorsten Klinger. Following a welcome speech by Prosecutor General Dr. Jörg Fröhlich, and an overview of the work of public prosecutor’s offices in Hamburg, Public Prosecutor John Oliver Strutz and government official Alfred Knütter gave a lecture on criminal investigations of legal entities in the course of insolvency cases. At the last stop of the visit at the Gerichtsvollzieherverband Hamburg e.V. 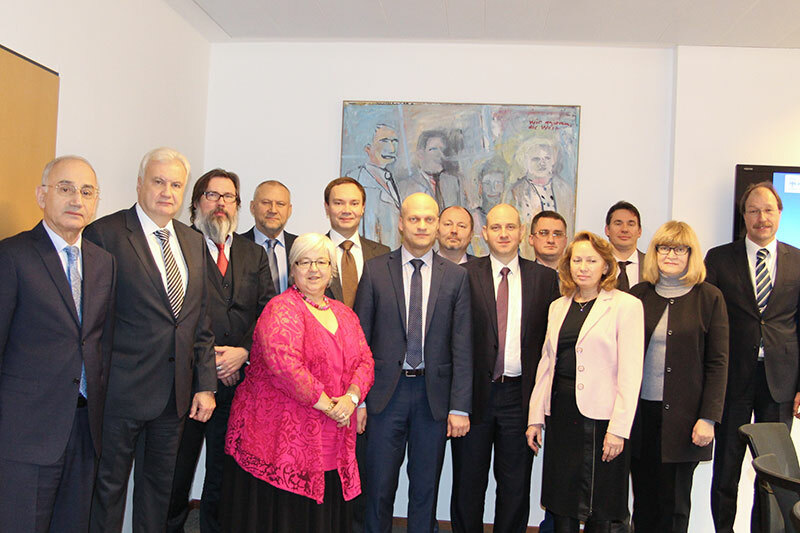 (Association of Court Bailiffs), the Russian guests discussed the activity of court bailiffs with Senior Court Bailiff Jonny Krautwurst, who is also Chairman of the Association, and his colleague Wilkowsky, Managing Director of the Association of Court Bailiffs. The members of the delegation showed a great deal of interest in the explanations and discussions with their German colleagues, which was also reflected in the many questions they asked their German counterparts. The successful German-Russian dialogue is set to continue in the same format. From 10 to 12 April 2018, the fifth International Forum on Best Practices in Local Self-Government was held in Bishkek, the capital of Kyrgyzstan. The main organiser of the Forum was the Union of Russian Cities. The event was supported by the government of the Republic of Kyrgyzstan and by the Bishkek city council. The event served as a platform for the exchange of established practices in local self-government and brought together high-ranking Russian personalities from local self-government, as well as international participants from other countries, including China, Turkey, Finland, Belarus, Armenia, Tajikistan, Kazakhstan, Moldova, the USA and Germany. The IRZ, supported by an institutional grant from the German Federal Ministry of Justice and Consumer Protection, was represented by Jürgen Roters, a lawyer and former mayor of the city of Cologne. The official opening was attended by the Deputy Prime Minister of the Republic of Kyrgyzstan, Dair Kenekeev, the mayor of Bishkek, Albek Ibraimov, and the chairperson of the Bishkek city council (Kenesch), Almas Kenenbaev. In his first lecture on “Investments and the investment climate”, IRZ expert Jürgen Roters talked about the great need for investment in building and renewing infrastructure and presented public-private partnerships as a model for the future. In his second lecture, Jürgen Roters talked about the subject of “climate change”, starting with a general presentation of the causes and consequences of climate change and then introducing the city of Cologne’s projects on energy efficiency and saving energy. He also presented the “GrowSmarter” EU project, which has been awarded to the city of Cologne in close cooperation with other partners. As these lectures were met with great interest by the participants and event organisers alike, further events on local self-government are being planned with the Russian partners with the participation of Jürgen Roters. Since the Russian guests had various focuses of interest the topics of the expert talks were very diverse. At the Federal Patent Court and the German Patent and Trademark Office they not only discussed issues of patent and trademark law, but also the specifics of trademark protection and the protection of intellectual property, trademarks in general and the trademark procedure at the DPMA. the auction of real estate by court order. Apart from these responsibilities of the Local Court, the delegation also had the opportunity to visit the land registry office and the Registration Court of the Local Court of Munich. Here, the company law procedures and matters of the Commercial Register were met with very great interest. During the meeting with the Office of the Public Prosecutor General of Munich, in which, amongst others, Andreas Wimmer, Deputy Director and leading Senior Public Prosecutor at the Office of the Public Prosecutor General of Munich, participated, the professional law procedures concerning lawyers and the criminal liability of legal persons were discussed. 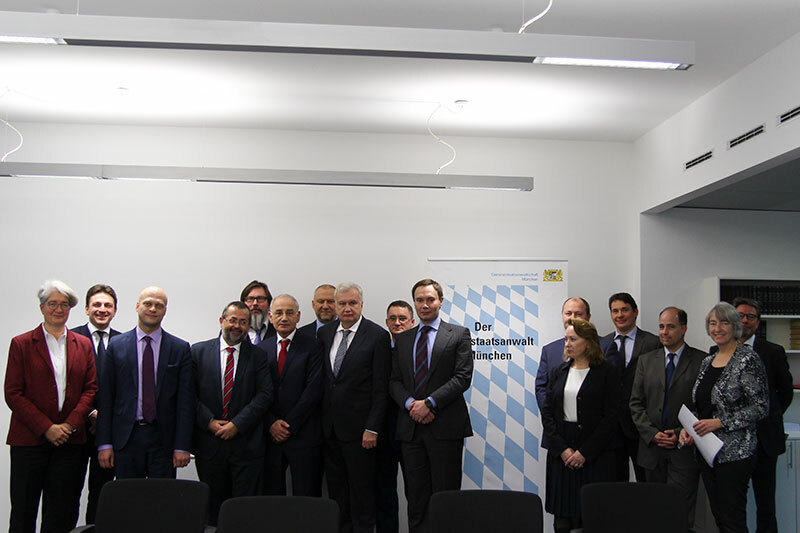 The delegation also had the opportunity to visit the Bavarian Ministry of Justice where they collected information about the role and tasks of the Ministry. Throughout the visit the German organisers were able to ensure the reception of the high-ranking delegation with regard to protocol, in particular the reception of the Deputy Minister of Justice of the Russian Federation, Denis Novak, by the Bavarian Minister of Justice, Prof. Dr. Winfried Bausback. The Russian guests appreciated the opportunity for an intense expert exchange with their German colleagues. The working visit in Munich was a great success for the delegation, so that they hope to continue the cooperation in the future.